BIRMINGHAM, Ala. -- Jarrett Hurd, bigger and stronger than Tony Harrison, walked Harrison down, roughed him up and knocked him out in the ninth round to win a vacant junior middleweight world title on Saturday night. Hurd had a few problems with the quicker Harrison, but Hurd's power was the difference. Harrison could not take it in their bout, which was the co-feature on the Premier Boxing Champions card headlined by the Deontay Wilder-Gerald Washington heavyweight world title fight at Legacy Arena. "It feels great to be a champion," Hurd said. "I've never had a feeling this great before. It's pure Accokeek [Maryland] power. I can finally pull my pants up now. My pants were falling down, but I finally got my belt." They were originally scheduled to fight in a world title elimination bout with the winner getting a mandatory shot at the 154-pound belt held by Jermall Charlo, but the fight was upgraded to a world title bout when Charlo vacated last week in order to move up to the middleweight division. It makes Hurd (20-0, 14 KOs) a major player now in a talented weight division. He won a world title and scored another impressive victory, after having dispatched undefeated opponents Frank Galarza and Mexican Olympian Oscar Molina -- as well as veteran former welterweight world title challenger Jo Jo Dan -- in his recent fights. Hurd and Harrison -- each of whom earned $125,000 -- tried to establish their jabs and landed some solid shots trough the competitive early rounds. Harrison had a strong third round as he put combinations together, including landing two hard shots seconds before the bell ended the round. Hurd had a strong fifth round, which he punctuated in the closing seconds, when he landed a clean right uppercut that rocked Harrison. Hurd, 26, of Accokeek, Maryland, roughed up Harrison (24-2, 20 KOs) in the seventh round, landing several hard right hands that had him backing up, holding on and in major trouble. Hurd continued to hurt Harrison, 26, of Detroit, in the eighth round. He landed a big right hand and pounded on Harrison with more than a dozen unanswered punches. Harrison was unsteady and then got nailed with a right uppercut and was in major trouble; only his enormous heart allowed him to finish the round on his feet. Hurd went right at Harrison in the ninth round and blasted him with a right hand on the chin that dropped Harrison on his back. Harrison barely beat the count, but referee Jim Korb appeared poised to allow him to continue. However, Harrison spit out his mouthpiece, and Korb waved off the fight at 2 minutes, 24 seconds, sending Hurd and his corner into celebration. "We wanted to take our time with him, because Harrison can box and move, but every time he fights, he wears down toward the end," Hurd said. "During the sixth round, he caught me with a good shot inside my left eye, but I managed to fight through it and get the win. 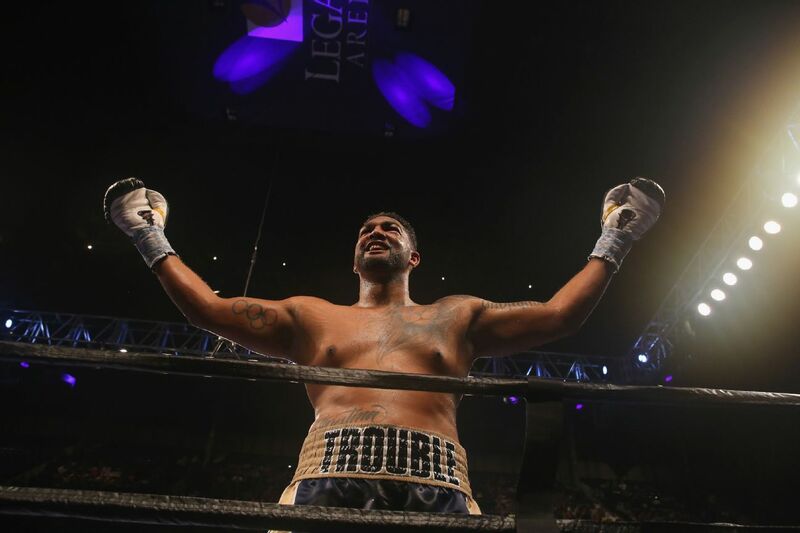 In a wild rock 'em, sock 'em fight of the year contender featuring four knockdowns, heavyweight Dominic Breazeale survived huge punishment and one knockdown to rally for a fifth-round knockout of Izuagbe Ugonoh. "That is what guts and heart are all about," promoter Lou DiBella said of Breazeale. "You have to respect that. How did he come back? All heart." It was an absolutely brutal fight that featured both men taking huge shots. Ugonoh appeared on his way to a knockout, before Breazeale turned the tables in his first fight since he traveled to England in June and got knocked out in the seventh round challenging Anthony Joshua for his heavyweight world title. "You gotta have heart," Breazeale said as he leaned over the ring ropes and shouted to press row after the fight. He showed tons of it. "Coming off the loss to Joshua, this win puts me right back in there," Breazeale said. "This is what I've always asked for. My team does an incredible job of getting me any fight I ask for, and I wanted to fight an undefeated guy like Izu. He's a big, strong, athletic guy. Tonight the story was about me having the heart of a lion, getting knocked down, but getting right back up to finish this fight." Ugonoh offered his take on the bout. "I expected that I was going to knock him out," Ugonoh said. "I believed I would accomplish that, but he didn't surprise me with anything. I was landing some good shots to both his body and his face. Breazeale showed a lot of heart though, and I think that his experience really helped him. I think a fight like Anthony Joshua really helped him realize that he could take anything and win the fight. He did that tonight." Ugonoh, a Poland-born Nigerian now based in New Zealand and making his United States debut, came in with a lot of hype and got off to a big start as he pounded Breazeale to the body. Ugonoh clearly won the first two rounds, and then things got crazy in the third round -- a round of the year contender. Ugonoh appeared on the verge of dropping his opponent 40 seconds into the third round, when he lashed Breazeale with two rights and a left. But as Ugonoh went to throw more shots, Breazeale countered with a right hand that dropped Ugonoh. Ugonoh beat the count and stormed back, forcing Breazeale to grab on to him and tackle him to the mat. "It took a little for me to find my pace, but eventually I found my rhythm," Breazeale said. "Izu came in in great shape and with guns a-blazing. He came at me with some stuff that I wasn't expecting. Him being the lighter guy, I wasn't really expecting the power he possessed. "I was able to connect some big shots tonight, especially with my right hand. You see what happens when. I put him down, and he never really recovered." Ugonoh (17-1, 14 KOs) continued to pound Breazeale (18-1, 16 KOs), a 2012 U.S. Olympian from Los Angeles, in the fourth round. Breazeale's left eye was bruised and nearly closed as Ugonoh pounded him with four clean right hands to send him to the mat face first. Breazeale was in bad shape, but referee Jeff Dodson allowed the fight to continue. Ugonoh dished out punishment for the rest of the round. Breazeale recovered enough between rounds to drop former Polish kickboxing champion Ugonoh to a knee with a right hand early in the fifth round. Moments later, Breazeale landed a combination that sent the tiring Ugonoh through the ropes and onto the ring apron, nearly out of the ring, and Dodson waved off the fight 50 seconds into the round as the crowd went wild. "Honestly, I just got tired," Ugonoh said. "I gave him what I had, and then I got tired. When he came back at me, I wasn't able to keep up and finish through on my game plan." Breazeale, 31, earned $175,000 and Ugonoh, 30, a stablemate and training partner of heavyweight world titleholder Joseph Parker, made $75,000. Heavyweight prospect Junior Fa (10-0, 7 KOs), of New Zealand, made his American debut in his first fight since signing with promoter Lou DiBella, and he relentlessly battered Keith Barr (17-11-1, 7 KOs) en route to a third-round knockout. The 6-foot-5, 272-pound Fa, who went 2-2 against world titleholder Joseph Parker in the amateur ranks, methodically beat down Barr with textbook left jab-right combinations time and again. He dropped Barr, 32, of Glenville, West Virginia, in the second round and hammered him around the ring for most of the round. In the third round, he landed at will, connecting with about two dozen unanswered punches before a left hook to the body dropped Barr to a knee. Moments later, the 27-year-old Fa landed another body shot for another knockdown, and referee Flynn Gerald waved off the fight at 2 minutes, 36 seconds. Los Angeles-based heavyweight Iago Kiladze (25-1, 17 KOs), who is from the former Soviet republic of Georgia, annihilated journeyman Byron Polley (30-20-1, 13 KOs), of St. Joseph, Missouri, knocking him out in the first round. Kiladze dropped Polley with powerful right hands twice, including for the count at 2 minutes, 11 seconds. Tuscaloosa, Alabama, cruiserweight Deon Nicholson (3-0, 3 KOs) blew away Josh Rasberry (0-1, 0 KOs), of Bessemer, Alabama, in a first-round knockout victory. Nicholson blasted Bessmer with an overhand right, knocking him out in just 40 seconds. Middleweight Thomas Knox (2-0, 1 KO), of Northport, Alabama, easily outpointed Anthony Retic (0-1, 0 KOs), of Homewood, Alabama. He got the nod 40-36, 39-37 and 39-37. In a grotesque mismatch, Orlando, Florida, heavyweight Robert Alfonso (11-0, 4 KOs) scored three quick knockdowns against hapless Keith Thompson (8-5, 6 KOs), of Tuscaloosa, in a first-round knockout at 2 minutes, 13 seconds.